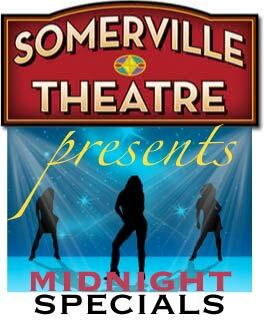 The Hubba-Hub of the Universe: Somerville Theatre presents: Midnight Specials! Every Friday and Saturday night, Somerville Theatre will be screening hand-selected film favorites for your guilty-viewing-pleasure. preceding the SATURDAY NIGHT screenings ONLY. Come at 11:30PM for maximum amazingness! Every Saturday night pre-show will feature live music, comedy, dancing, and burlesque, and will be tailored to complement the movie of the night. Excitement! Movie schedule can be found on the Somerville Theatre website. To keep up with the live stage shows' lineups, check out the event on Facebook. C'mon everybody, Let's go to the movies!